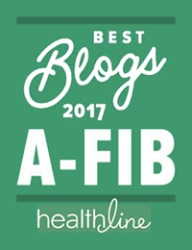 A-Fib Drug Therapy: Post Ablation Blood Thinners? 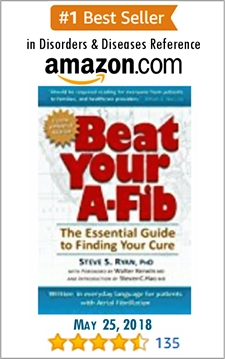 If you’re no longer in A-Fib, you’re also no longer in danger of having an A-Fib stroke. But you can have a “normal” stroke, i.e. a stroke that doesn’t originate from being in A-Fib. That’s probably what your doctor is worried about. “Silent” A-Fib isn’t as much a problem as in the past. 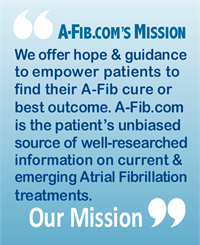 Today’s A-Fib catheter ablation doctors follow their patients for long periods of time after a successful catheter ablation and use an extensive array of monitoring devices to tell if a patient is in “silent” A-Fib. (See: A Primer: Ambulatory Heart Rhythm Monitors) It’s unlikely you’d experience a long period of silent A-Fib without your doctor being aware, though doctors and monitoring devices aren’t infallible. Most doctors say you don’t need to worry about short A-Fib episodes. 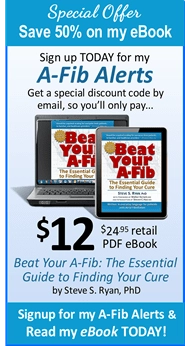 Conventional wisdom says it takes 24-48 hours of being in A-Fib for a clot to form. 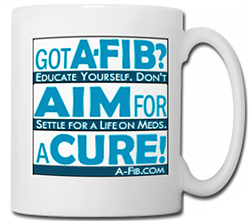 Though some doctors think it takes as little as 5 1/2 hours of being in A-Fib for a clot to develop. Don’t be hesitant about getting a second opinion if you’re worried about having to be on an anticoagulant. No one should be on blood thinners unless there’s a real risk of stroke. • Post-Ablation “Pill-In-The-Pocket”: Katharine emailed me several months after her successful catheter ablation. Instead of a daily anticoagulant, she carries rivaroxiban (Xarelto) with her which she would use if she felt an A-Fib episode coming on (though she’s never had to use it). The rivaroxiban would work to prevent a clot from forming. (No clinical trials have been done using this strategy,) This approach means Katharine isn’t on an anticoagulant for long periods of time or for the rest of her life. Be advised that this web site is not recommending or suggesting that you quit taking prescription blood thinners. 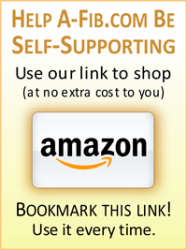 • “Natural” Blood Thinners: Do your own research, then discuss this option with your doctor. There are several informative articles about Natural Blood Thinners at LIVESTRONG.COM and an extensive article, “Blood Thinners and Nutritional Supplement” by Dr. Lam on his website. • Left Atrial Appendage (LAA) Occlusion Devices: The theory behind these devices which close off the opening of the Left Atrial Appendage is that 90%-95% of A-Fib clots come from the LAA. From My Mailbox: Catheter Ablation Complication Rate: Compared to What?